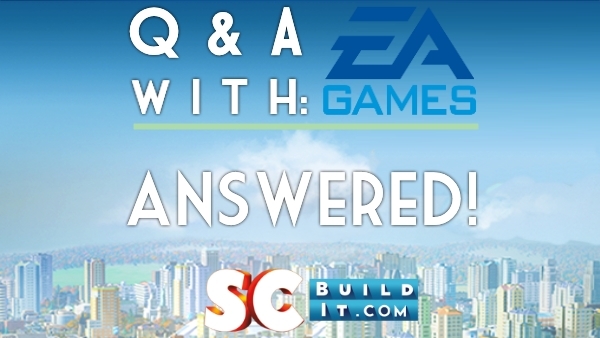 Home Editor's Picks SimCity BuildIt – Q&A With EA & the Game Developers – ANSWERED! Fellow mayors! We have a special post this weekend, as EA and Track Twenty and some of the scbuildit.com community and other mayors finished up our Town Hall meeting and Q&A session. Lots of great answers as well as hints to upcoming features! So let’s begin! CDo you have any plans to reform the Global Trade HQ into something far more usable for players? There is countless suggestions on how to change the GTHQ coming straight from the community that may be worth considering if you plan on changing it; there is also the obvious issue of SimCity Buildit being considered a ‘freemium’ game which brings me to my second point: Is the Trade system in the game like that for a reason? To add a challenge to the game maybe? EAThis is an awesome question. The popularity of the trading has far exceeded our expectations. The volume of daily transactions is higher than on the NASDAQ stock excahange and the trading market is a massive eco system on its own. We are consistently working on ways to improve the market. We are gathering feedback and reading user comments and are looking for ways to create a better flow and user experience in the market. Sometimes, when you build a game, the feature you least expect is the most fun. We love that you guys want more of GTHQ! As we continue to fine tune this feature, we’ll be sure to share the updates. JFOn a lighter note, here’s a more technical question from joefiorini on the /r/SCBuildit subreddit. “As a developer, I’ve been fairly impressed by the responsiveness of the global trade center; it definitely has its problems, but it always loads. What is the average load of your trade center endpoints (requests per second or something)? What’s the underlying technology handling the rendering (is it a WebSocket API with the client rendering a collection view or an HTML endpoint)?”. C What were the main problems that had to be overcome when developing the game? EAMain problems we overcame: This is a question that is near & dear to our hearts, thanks for asking. You guys know, SimCity is a 25 year old brand, and with such a popular IP, loved by millions, we knew we were going to have to meet the expectations of OG & new fans alike. . We worked hard to reimagine what SimCity would be on mobile devices. There are major differences between how games are played on the PC & mobile platforms. To create SimCity BuildIt, we had to consider everything from screen size, to file size to play styles. The question that kicked off this project was: how do we design a game for our players that loved playing SimCity while sitting in front a PC at home? How much can we remain true to the original experience? Can we? Should we? How do we do this while also creating a new, interesting & fun experience for players playing on their mobile devices while they’re out in the world? Is this even possible? In the end, this game is something that we are all very proud of, and we’re working on tweaking & improving it. This is why speaking to leaders of our community is important to us. This is as much your game as it is ours, so thank you for reaching out to your community to source questions & feedback. It means the absolute world to us that you love the game. CHow long was the game in production? EABased on our families’ feedback, we all disappeared for about a year and half while building this game. In all seriousness, the initial development time took a year and a half, but with SimCity – as with all other live services – the development never stops, and we work to make the game a continued enjoyable experience and bring new content for players. We’re really excited to continue to release new content and will be looking to our community to make sure we’re on the right track! Is there any plans to add a sandbox mode to allow people to re organise their city without demolishing roads etc? EASandbox mode/reorganizing idea: This is a really interesting idea, writing it down for future brainstorms. Right now, there are currently no plans to add a sandbox mode to the game. CHow do you feel about the cheats and hacks that are currently available for the game and what changes, if any, are you considering to encourage mayors to play without resorting to using the cheats? Do you agree that making the game easier would relieve frustration and encourage proper play? This links in with another point. Is the game Challenging for a reason? many people resort to cheats after spending hundreds of dollars and still being no where near “Completing” the game. EAThanks for bringing this up. We do not recommend Mayors to download hacks or cheats for the game. We try to give our Mayor’s meaningful short-term and long-term goals to strive for and toward. And as far as completing SCBI, it won’t have an “end”. We’ll always have new content and new goals for our players. As far as hacking our game, we don’t recommend eating an entire bag of candy at once. It kind of ruins the fun of it. And personally, it bums us out when people do it. CHow is tax calculated? We’ve been collecting a lot of data and have a few equations for getting a rough estimate and so far it seems to be based off only population and happiness. EAWe would respond to that but unfortunately the tax man ran away with our calculations! CHow many people are part of the Helsinki team? EAAt the moment we are a 30+ team with everyone working hard on SimCity BuildIt. CWhere is the game headed? What should we expect from the game in the near future? Do you have any new features or exciting news that you’re able to share with us? EAAs you know just released Tokyo Town which adds an international airport, new residential buildings and some cool entertainment and landmark buildings such as the Himeji Castle and the Sumo Hall for our higher-level players. Our plan is to constantly provide new and exciting things for SimCity BuildIt with regular intervals, and we are already working on something really big for the 2015 holiday season. Stay tuned! CIs there any plans to make adding friends a little more worth while? For example being able to speak to them and add more things for people to do when visiting friends? EAGreat suggestion but there are no plans to add chatting features to friends, but you can easily use other chat applications alongside SimCity BuildIt, and we’re working on new social features that we’ll start rolling out soon. VRAre there any plans to improve the social aspect of the game? Improved friends list management? More incentive to visit your friends city (e.g. speed up production / boost tax collection)? EAYes, vortexrap! Most definitely. The social functionality of the game something that we’ve received a lot of feedback on. Our players want it to be more of a social experience, and we do too! For the next update we are designing a system that will reward you for visiting your friends, with even more improvements for the social gaming aspect planned in the following updates. It’s coming soon, and we hope you love it! VRWould the dev team consider an option to allow to hide the game HUD? It would be great for content creators as well as everyday Mayors that would like to see their cities unobstructed by the information overlay. EAGreat idea about the HUD! We’ve noticed that users want to share their cities with their friends, and we’ve been talking about a camera mode feature that would enable this. We’d love to help you share beautiful, clean screen shots of your SCBI masterpiece. Stay tuned – this could be something that appears in the future. VRSince the Tokyo Town update was released, a lot of people, including myself, were generally happy with the release. However, I do have a couple concerns: a. 18 Hours for a cargo shipment seems like a very long time, considering the cargo dock requires 6ish. Mayor’s would like to build these new Tokyo town buildings, but the wait time seems high. b. The new slick animations look and work great on newer end phones, but some Mayor’s have noted performance drops on older phones. Would the dev team look into performance improvements for lower end phones? EAThanks for the feedback! We want to give you reasons to leave our game and come back later to pick up where you left off. As much as we’d like it if you spent every waking moment in our game, we tried to balance the game play so you could put us down and come back. The 18 hour timer is something that we are watching closely. We can’t say for sure that we nailed the perfect balance yet but we had to figure out how to unlock the new content quick enough so you’d be super excited to get it into your city and slow enough that you wouldn’t finish Tokyo Town in 3 minutes. If we spend weeks developing new content that a player completes in 3 minutes, we would need to set up cots next to our desks. That said, we will see if any changes will come to it in the future. We would love to know which phone models that have experienced the performance drops. It would help us with investigating what might be causing these performance drops. Can you help us out? VRFun questions: What level are your cities?! What is your favorite in-game product (dozer blades, donuts, etc.) and why? If you could add a new real world building into the game, what would it be? EAAmelie: Hi guys, I’m your Community Manager and the host of this Q&A. Thanks so much again for participating and asking such great questions! I’m Level 14 (for shame! In my defense, I’m building my city veeeeery slowly.) My favourite item: Donuts. I have fond memories from the great donut inflation. My favourite building: I would love to have the Shard in London in the game, and then I’d pretend that it’s the Eye of Sauron. TrackTwenty (the game devs) get involved and share some of their answers! TT Inka: Hey guys, I’m the game producer I have a level 23 which is pretty good. We all have access to development build that allow us to skip around in the world to make sure everything is working. My favourite in-game product: The donuts. This feature is important to me because we’ve actually fixed the demand for them now! My favourite building: Kiasma – The Helsinki Museum of modern arts. It’s so cool! TT Matti: Hello, I’m the SCBI Tech Lead. I’m level 35 – so Amelie & Inka have some obvious catching up to do. My favourite item: The ice cream sandwich My favourite building: I would rather add bridges than buildings! SABesides viewing towns, are there any plans to add additional incentives/benefits to adding friends in the game? Have there been considerations for gifting simoleans or materials? EAAt the moment there is one achievement regarding adding friends. As we mentioned in response to vortexrap’s question, we’re working to make the game much more social and give you more reasons to play with your friends! SAThere are plenty of GTHQ questions already but I have just one more. Is it possible that purchasing items can occur directly inside of the GTHQ window? As much as I enjoy loading up another city and seeing how they’ve developed their town, I’m really curious as to why purchasing can’t happen directly at the GTHQ? EAThanks Andrew – we really appreciate the feedback. We would like to offer our Mayors the possibility to show multiple items under one advertisement. Because of the future visiting features, we would like for Mayors to be able to visit each other as well. When we created the trading system, we wanted to give out a feel of the game being a SimCity world rather than a SimCity single player game. We wanted Mayors to visit each other and explore each other’s cities. SAWhat are the mean, median, and maximum level of all players (global, by region)? BI am sure there are more issues people are having besides the trade center. Lets look at the friends set up. I have seen many people ask about just adding friends through the app, such as visiting there city and having a add to friends tab there. Or being able to use Origin accounts for the sign in. EAWow – you guys are good. We actually have had plans about adding friends through the app, but it is not being developed at the moment. We’d love to learn more about what this feature would add to your experience. But unfortunately, we have no plans about using Origin for the sign in. BPeople are having problems with seeing friends through Game Center and through Google+. EAThanks for letting us know BurghBaby about the issue! This is really important to us and we’re investigating this as we speak! BThen there’s the issue of…. can we start our game that is attached to our facebook over? I want to start from level one, how i do that without having to get another facebook account? I see that one alot on the boards….some say you can go to your facebook account on a computer, go to apps and remove the app you no longer want to be connected. Has this been tested? I know i have not tested it myself. Does this actually work? If it does great, problem solved. But if it doesn’t, why not give us the option to start our city over. BWhat about a storage button? Why are we not allowed to store buildings so we can rearrange our cities? I know we can move everything around, but without the proper placement, our sims get mad. For myself, this is not a problem, but you do have some serious players that get upset when their sims are not happy. EAThanks for this gathering this feedback from your community BurghBaby! At the moment there is no way to store your buildings – we’ll look into it. In the meantime, please apologize on our behalf to the angry townspeople. We’d be mad if someone picked up our house and moved it next to a factory in order to make room for a new llama too. BIs there a plan in action for a confirm spend option in the game? Players are stating they are spending sims cash on extra production spaces without meaning to. EAThanks so much for the question! There are no plans to add this button in our present backlog of features but we’d love to learn more about the need for this functionality. Based on your feedback, we might add it as a setting in the future. EAWe’re working to improve the experience to make it fair, fun and more accessible. Running an economy with more transactions than the stock market per day (yes, that’s true) is pretty complicated, but we’re hard at work to get it right. We’re enhancing the experience on the back-end as we speak but it might be a while until you see visible changes to the UI. We also want to make sure we don’t crash the thing while trying to make it better Keep the feedback coming. JWMy next question would be, are we going to see more land expansions? You’ve introduced the Tokyo buildings, but I have absolutely no room to put them anywhere. I’m at capacity with 1.55 million people. I’ve started bulldozing buildings to put in the Tokyo ones. EACongrats! 1.55 M population is no easy feat! We are impressed. You will absolutely see more land expansions. The sky is the limit on this one. We’ll be releasing more expansions gradually over time. Thanks to all that contributed and especially to EA and TrackTwenty for hosting and responding to our questions. It is great to see the devs and publishers listening and responding to our concerns and comments (as well as answering some fun questions!). I’m excited to see what the Holiday 2015 surprise is, as well as future updates and changes. Drop comments below on what you thought of the town hall! As always, build on Mayors!